Standing cup, nef; bloodstone; mounted in chased gold; enamelled and jewelled; boat-shaped cup, five pillars at stern forming a balustrade, rails enamelled lavender and white and set with cabochon emerald and carbuncles; on each side of edge are chased and enamelled cartouches; below are two pecten-shaped hollows; shell-shaped stem with two collars, enamelled white and set with emeralds; oval foot enamelled blue and set with five carbuncles. Origin: Uncertain; previously described as 'German, 16th century', but more probably the boat-shaped bowl is French, early 17th century. Most of the remaining features were probably added during 19th century, including the gold mounts. Commentary: In Read 1902 and Dalton 1927 the heliotrope nef was described as “German, 16th century”, but the unconvincing qualities of the overall design of this standing-cup made it necessary to reconsider this attribution in the light of more recent studies on this subject (see R. Distelberger, Beobachtungen zu den Steinsechneiderwerkstätten der Miseroni in Mailand und Prag, ‘Jahrbuch der Kunsthistorischen Sammlungen in Wien’ vol. 74, 1978, pp. 79-152). The carving of the boat-shaped bowl is noticeably different from that of the stem and the balustrade, both of which have a modern, almost mechanical, character. The carving of the oval foot, on the other hand, may be the same as the bowl but, as it is undecorated and its rim is hidden beneath the gold mount, no firm conclusion is yet possible. The most distinctive feature of the decoration on the bowl is the accomplished carving of the two hollows in the form of scallop shells (on either side, immediately above the stem). Although very unusual indeed, this particular form of decoration is to be found on one hardstone tazza bowl in the Treasure of the Dauphin in the Museo del Prado, Madrid (see D. A. Iñiguez, ‘Catálogo de las Alhajas de Delfín’, Museo del Prado, Madrid, 1989, p. 29, no. 5, col. pl. and an 1890 photo; also p. 244, with illus., where the tazza is shown in a dismantled state; also, for an excellent illustration of the carved details of the underside of the tazza bowl, see E. Steingraber (ed. ), ‘Royal Treasures’, trans. Stefan de Haan, New York, 1969, p. 42, pl. 16). This chalcedony tazza, which was recorded in the 1776 Inventory as a “taza grande”, has carved ornament on the underside of the bowl comprising a wide inner zone of fluted gadroons in relief and then a narrower plain zone punctuated by eight scallop shells hollowed out of the thickness of the bowl and carved in low relief with the ribs of the shells radiating outwards towards the rim. Their execution is so similar to those on the heliotrope boat-shaped bowl that it seems very probable that they have a common origin - perhaps in a French workshop, early in the seventeenth century. The simple boat-shaped bowl is a form occasionally found in rock-crystal cups (see Iñiguez 1989, pp. 124-5, no. 78, for the example in the Treasure of the Dauphin; also J. Hein, Versteinertes Eis. Gefässe aus Bergkristall und Halbedelsteinen des Grunen Kabinetts in Schloss Rosenberg, ‘Kunst und Antiquitäten’, I, 1985, p. 37, fig. 3, for a Danish royal collection example; also E. Kris, ‘Meister und Meisterwerke de Steinschneidekunst in der Italienischen Renaissance’, Vienna, 1929, p. 183, figs 512-4, for a Saracchi workshop example in the Hapsburg collections) but it is more rarely found among the extant carved hardstone cups. 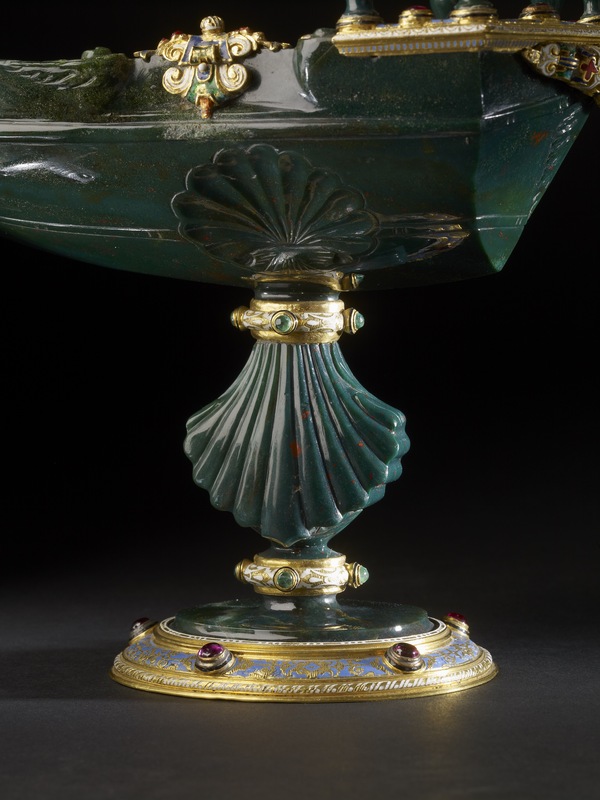 Nevertheless, a green jasper standing-cup that entered the collection of Louis XIV between 1681 and 1684 and is preserved in the Galerie d'Apollon of the Louvre (inv. no. MR. 172), has many similarities. Although the shape of the nef or 'boat' itself is less pointed, there is much in common with the carving of the rim, especially the four spiralling scrolls, and of the hull, where the longitudinal narrow bands in low relief enclose simple scroll ornament. Despite its royal provenance, this jasper cup is not mounted in gold; its two baroque-style handles, stem- collars and foot-rim are copper-gilt, with some enamelling on the floral motifs around the foot. Consequently, the inconclusive evidence from the Prado and the Louvre supports the attribution of the heliotrope bowl of the London nef to a French workshop, probably early in the seventeenth century. There are, by contrast, no parallels to be found for the shell-shaped stem, which creates such a visually uncomfortable link between the bowl and the foot, but was, perhaps, inspired by the scallop shells carved on the hull of the nef itself. Similarly, the angular and rather ungainly balustrade around the stem is without parallel among hardstone cups but could have been derived from the magnificent semicircular balustrade of the monumental rock-crystal nef in the Treasure of the Dauphin in Madrid (Iñiguez 1989, pp. 180-1, no. 114, where it is identified with item 135 in the 1776 Inventory). The rock-crystal columns are slightly more elaborately turned but, significantly, they alternate with a spherical knop of rock-crystal - rather as the heliotrope columns alternate with a hemispherical cabochon ruby. Evidence of the nineteenth-century faker's interest in nefs with this type of gem-set and enamelled gold balustrades can be found among the 1,079 drawings from the Aachen workshop of Reinhold Vasters (1827-1909) which were presented to the Victoria and Albert Museum in 1919 (inv. no. E. 2597-1919). This drawing of the pseudo-Renaissance rock-crystal nef, which incorporates two balustrades in the design, suggests an even greater lack of understanding of the Renaissance prototypes and therefore implies that it is unlikely that Vasters' workshop was responsible for the manufacture of the embellishments that now surround the boat-shaped bowl of the London heliotrope nef. The settings of these fifteen very regular cabochon stones on the various gold mounts of the London nef are, however, entirely 'modern' and make little attempt to imitate the styles of the late Renaissance, whereas the two enamelled gold strapwork mounts (on either side of the rim of the bowl) are in the mid- or late sixteenth-century manner. The same might be said of the curious elongated strapwork mount (on the stern, below the balustrade), and yet this enamelled mount is also set with one of these hemispherical cabochon gemstones. Furthermore, the choice of a lavender enamel on the balustrade and of a bright, light blue on the foot-rim mount, together with the pseudo-Renaissance patterns in tooled gold (in both areas), establishes beyond doubt the nineteenth-century origin of these elements. As yet, the identity of this modern workshop has eluded current research, though it seems probable that it may have flourished in Paris during the second quarter of the nineteenth century. Hugh Tait, 'Catalogue of the Waddesdon Bequest in the British Museum. III. The Curiosities', British Museum, London, 1991, no.30, figs. 278-283.